Raging Rex is a video slot centred on everyone’s favourite lizard species. 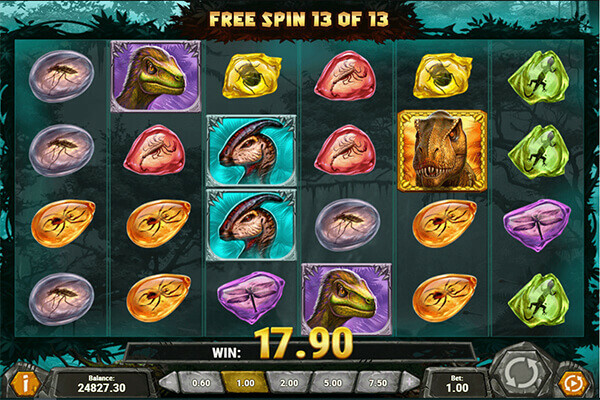 And while dinosaurs may be extinct in the real world, they still live on in this new Play’n Go casino slot. You will find multiple species still wandering the reels without a care in the world. Alongside them, players will see various animals encased in amber, their corpses preserved for future examination. Thanks to the transparent reels, gamblers are in for a visual treat, with a beautifully animated background image. The game is played on 6-reel, 4-row playing field with 4,096 ways to win. Special features include the Rampage re-spins, free spins with unlimited re-triggers and one of two bonuses that players can pick to enhance the special feature. The furious T-rex awaits all challengers who think they are worthy. Will you succeed in the face of danger? Or will you simply end up the dinosaur’s next meal? Play’n Go have a strong art team that makes all of their titles look gorgeous, and this one is no exception. Every dinosaur has its own little animation, with the T-rex being the most impressive. Seeing that massive creature barrelling down the playing field and taking out anything in its path looks fantastic. There are only two bonuses available to gamblers, but each has a slight twist to the regular formula. Re-spins are triggered by the fully stacked Wild symbol, while free spins give you a choice between two different mini-features to activate for their duration. Thanks to the high volatility, the maximum win in Raging Rex is an amazing 5,000x your total bet. The RTP for this Play’n Go release is 96.34%, promising solid value for your spent money. (Check our list of loosest slots for higher return). If you fall under the casual player category, you may want to skip Raging Rex. The high variance gives some awesome jackpots, but it also requires a large investment up front. If you decide to play, make sure to budget accordingly, or you will your balance quickly running red. We like the fact this slot does not take shortcuts. Rather than using two generic special features and calling it a day, the developers went the extra mile. As a result, both bonuses feel great when they appear on the reels, even if they can be somewhat rare. When the angry dinosaur comes knocking, everything else moves to make way. So long as a fully stacked T-Rex exists on the reels, free re-spins will be awarded to gamblers. The dinosaur moves one reel to the left each re-spin, while the other position on the board change around him. The Rampage special feature ends when the T-Rex reaches the first reel. Wild Hunt, where extra Wilds can appear on the playing field with multipliers. Multipliers can combine together to a maximum 243x. Primal Rage, which guaranteed a single, fully expanded T-rex each spin. This video slot has every part of it fine-tuned for maximum enjoyment. The graphics are top notch, the gameplay is fun, and the bonuses all bring some fantastic winning potential. If what you have read in the review so far sounds fun, give it a spin. Just make sure to mind the high variance!